Comfortable, casual, yet sophisticated, one-piece playsuit in either shorts or ankle-length. Its shoulder ties and elasticized waist allow for a custom fit. The side slant pockets with contrast lining that give the illusion of piping, and pleated front detail, make this playsuit one-of-a-kind. The leg is slightly gathered into cuffs for a flattering fit. 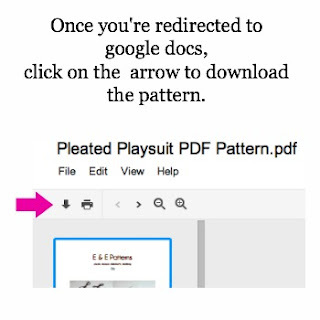 In order to simplify the drafting and digitizing process, the bodice front & back and facing are all on one pattern piece, as are the pocket and pocket lining. It is recommended to trace each piece separately before cutting your fabric. Refer to the coloured diagrams on the pattern pages iv and vii for reference. This is a complimentary pattern in appreciation for all the wonderful supporters who have been following me along my sewing/designing journey here at E&E. I sincerely thank you all for your kindness, encouragement, and support! This pattern is my gift to you! 68 comments on "Pleated Playsuit Pattern"
The link isn't working. And thank you thank you thank you!!! I'm so excited! Thank you Heidi!!! You did a simply MAHVELOUS job! Thank you so much!!! I am in love with your patterns!! Thank you so so much. This is so cute and can't wait to make 1 for each of my 3 granddaughters! 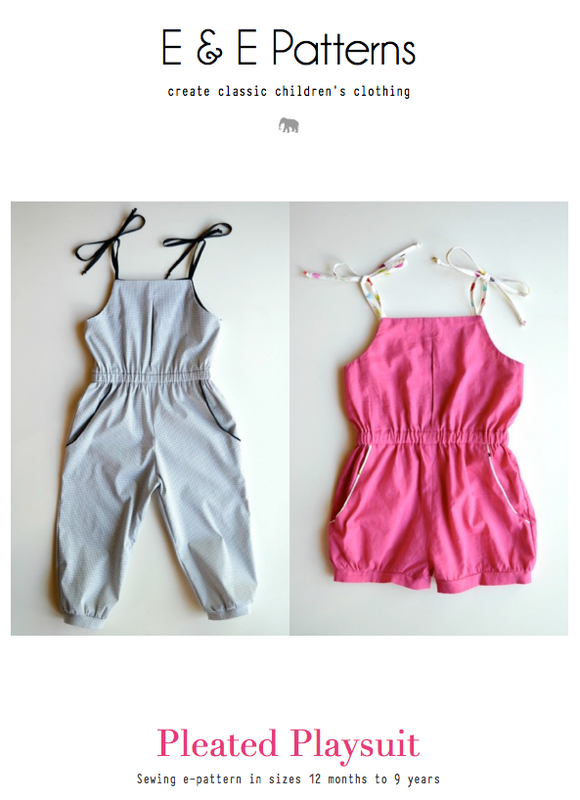 I also got that same cart error, I am so excited to make this adorable romper. Thank you so very much!! I receive the following error when I attempt to checkout: Cart Error: Free Checkout will be available again on May 31, 2013 @ 00:00 MST. I could not download it either due to the same error reported in the previous comment. Thanks for the free pattern! Love it! That was so generous of you! Thank you! The Google doc link worked! My granddaughter is going to love this! Such a cute romper!!! Thank you so much! I'm so in awe of you right now Heidi! SO generous of you to give this adorable pattern away! I'm downloading right now. My goodness, you are amazing. Thank you for sharing this pattern. I'll be sending it off to my mom to sew up for my daughter. She'll be way faster than me. Thanks for the pattern however the link isn't working. Thank you so much for this lovely complimentary pattern. I've been following your blog for some time now and always appreciate your classic style. I've sewn up a whole pile of Bubble Pocket Shorts this past month and I've really enjoyed the way your patterns are put together. They are very thorough, cleanly put together, and with clear directions. I can't wait to try this one out. Thank you for your generosity! Heidi this is SO generous! Thank you, and congrats on your well deserved success! I love this so much! Thank you so much! Oh, wow, thank you so much for your generosity, it is a wonderful pattern and I will definitely give it a go very soon!. Great thanks! Thank you so much! I can't wait to make this up for Button! So kind of you. Such a cute pattern and fun sew! Thank you! Will add a photo soon. Thank you so much! I am completely obsessed with your bubble pocket shorts, and can't wait to make this romper. So stinkin' cute!! I'm working on potty training my daughter, so, I may try and make a skirt instead of shorts. This pattern will definitely become one of my favorites. I am so excited to play around with fabrics and linings. I absolutely love the faux piping detail on the pockets. 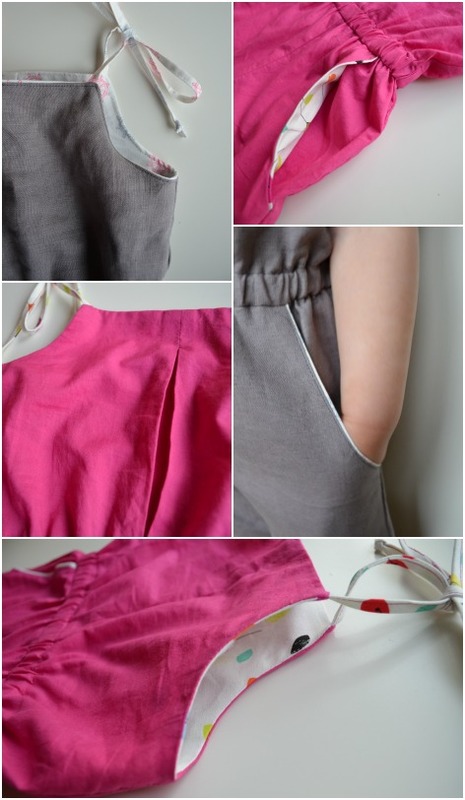 And pockets! My daughter in only interested in anything with pockets these days. Perfect! Thank you!!!!! Thank you soo much for all you have done. But the link isn't working. Please, to do something I have looked for this pattern since a long time. Thank you and good luck. I can't wait to make this for my daughter. Thank you!! I love your BLOG and i love your pattern! 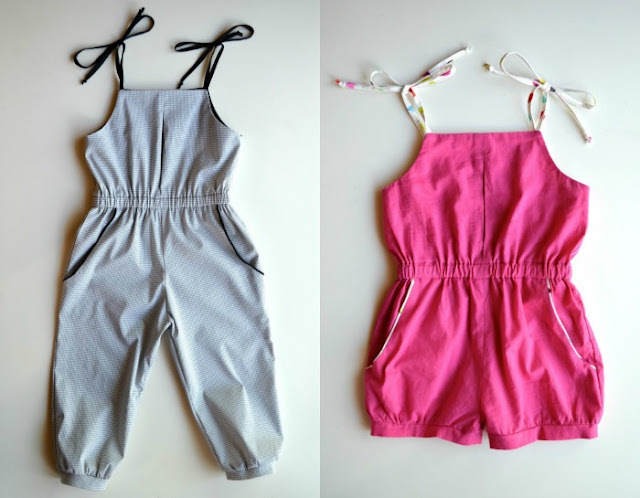 I will sew the playsuit for my little girl. BUT i can´t download the pattern! What´s the matter? Please, dear Heidi, can you send me an E-Mail with pattern-pdf.-file? I will show you the finished playsuit! Just made the pattern and love it- thanks so much for sharing it! Thank you so much voor this pattern. I made the playsuit for my 11mnds daughter. I love this pattern - thank you so much!!! I just finished one for my little cousin and used a vintage strawberry print pillowcase for fabric. Thanks so much for this free pattern! It was exactly what I'd been looking for. I saw the one you made it came out really cute!! I've been having problems with mine. Can you help me please? I'll greatly appreciated. On the pattern it shows 4 pants patterns two of them says "front pants" the other "back pants" and the other two don't have anything. Should I disregard those? I'm making a size 2-3y when I cut my patter the chest part comes out really small plus the design on the front makes it even more smaller. Is this normal? i'm pretty sure i'm making something wrong. Please help! I was wondering if anyone who has made this might be able to help me out. I seem to be having troubles finding the right pieces to cut out for the 12 month size. I'm really new to sewing and I'm quite confused. The pieces I'm having problems with are the Pant front and pant back (have traced and cut out the bodice pieces + interfacing and pockets/lining). I can't seem to make the look like the example on page 3. OH my gosh, as soon as I posted this, I think I figured it out. I guess I"ll see once I start making it. Will post my result when finished. Thank you so much for your free pattern and tutorial - its greatly appreciated. Thanks a bunch for this pattern. First of all thank you so much for sharing. I've been looking for the jumpsuit patterns all over the internet & I finally found this one. Thank you.. But I have a question. On the pattern it shows 4 pants patterns two of them says "front pants" the other "back pants" and the other two don't have anything. Should I disregard those? I'm making a size 2-3y when I cut my patter the chest part comes out really small plus the design on the front makes it even more smaller. Is this normal? i'm pretty sure i'm making something wrong. Please help! Greetings from Oklahoma, USA. I LOVE LOVE this. Two granddaughters 6 mos and 5 years will love it too. Thanks for all the sizes. Thanks. A great tutorial and pattern. Muchas gracias. Thank you ...thats exactly the pattern I was looking for ! I made this playsuit last night, the instructions were easy to follow and the sizing is great. My daughter who is 14mn looks adorable in it. I used hubby's old dress shirt to make it. This jumper is so cute...downloaded and made it for my granddaughter in one day. Super easy and came out beautiful. Thank you for sharing.